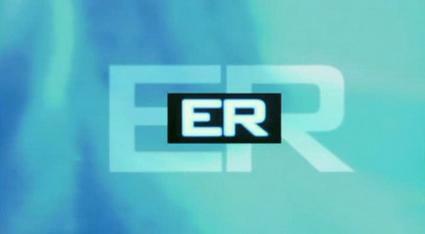 I was standing outside of the ER at the hospital the other day, waiting for Glen to pick me up. I do this often since a neurosurgeon told me the worst thing I can do for my neck injury is to drive. I have found his words to be true. When I drive, I usually pay the penalty for a week or two afterward with increased neck pain and headaches. To avoid this, my husband graciously acts as my chauffeur in most situations. Be still. How foreign that seems these days to be still and wait. But if we don't be still and wait on the Lord, how can we hear His voice? How can we know His will? 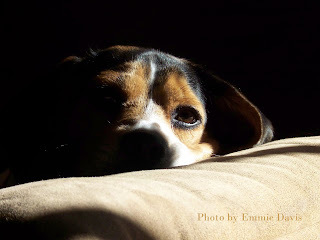 As I write this, my sweet beagle Sparrow is cuddled up next to me as close as possible. I love Sparrow so much and one of the reasons is because she teaches me so much. She teaches me about how I should respond to the Lord, and how my feelings for her are a tiny shadow of what the Lord feels for me. When we leave in the morning for the hospital, Sparrow often gets to ride with us (she loves car rides.) But she will stand still and watch me, her eyes looking to me for guidance, waiting to see when I start to leave. She doesn't rush ahead of me. When I start to walk toward the door, then she follows. Each morning, her simple act of respect and love touches my heart. Her acknowledgment of me as her authority and leader humbles me and strengthens my role at the same time. When I come home in the afternoon, she is waiting at the door, not only her tail wagging, but her whole body wagging in joy. She is thrilled when I bend over and pet her and talk to her about her day. And I am thrilled that she has come to greet me with such obvious devotion. How much more must be the relationship we have with our Lord. When we still ourselves to see that "He is God", and in doing so acknowledge His authority and Headship in our lives, how much it must touch His heart. When we come to Him in devotion and love, how His heart is thrilled and filled with joy. He loves us. He cares for us. He joys over us with singing. We must only let ourselves be still. Be still and we will know that He alone is our God. And we will know that He alone is enough. It was a very hard day. the morning started with distracting myself from what was to happen in the afternoon. It seemed as if Noah would never return from the Unit, but I didn't mind the delay too much -- it kept that inevitable moment at bay longer. then, more abruptly than I thought it should happen, the moment was upon us. We gathered on the carport while Glen prayer -- I had to concentrate on other things to keep from turning into a mass of tears. Then Em and I and the Glen said goodbye first, so that Aimee and Noah could have time alone. Once again eloquence neglected me. I had such a fragile grasp on control, I could only manage to say, "I love you son." After a quick kiss on the cheek, I walked away and retreated to the dark quiet of my bedroom and burst into tears. I knew that sometime while I was in there, he drove away and not watching that truck leave seemed much more difficult than watching the van pull away toward Parris Island three years earlier. Overall, the emotions of the day were much harder than I had imagined but deep within a quiet peace prevailed. It is a strange combination, this deep intense emotion in the feelings and the quiet calm in the Spirit. The thoughtfulness of friends at work brought more tears, but grateful ones. Like a blanket on a cold day, their love wrapped around me and warmed my aching soul. It reminded me of Aimee, after I had said goodbye to Noah and had come into the house, she hugged me and said, "Don't cry, he'll be okay." And I had thought I would be comforting her! I was a hard day, a very hard day, but in some respects, a very good day, too. Try as I might, I could not see the wind. I could see leaves moving, I could see branches bending. I could feel my hair swirling around my head, but I could not see the wind itself. I could feel it on my face, and it's coolness was a refreshing promise of fall finally coming to the warmer part of our country. But I could not see the wind. Recently, I have had the pleasure of coming in contact with several people with whom I went to high school, and some of the teachers at the school as well. I have enjoyed reconnecting and catching up with these familiar faces from the past, and it has made me look backward at the path my life has carved through time. While those days were going on, I often was unaware that the Lord was the "wind" pushing me along a certain turn in the path. Sometimes I just thought I was making my own choice, even though some -- like the choice to become a nurse -- seemed to just come out of the blue. Looking back though, I can easily see the leaves blown by, the branches bent. . .all the traces of the "wind" in my life. It humbles me, it makes me so grateful, to think that a merciful God was watching out for me and leading me, even when I thought I was leading myself. Oh, thank you Lord for parents that surely prayed for me often! Here in the Deep South, when the days are hot and humid, the worst of all are when there is no wind, no breeze, no respite to the oven we call our climate. Sometimes in our lives we walk through some "dog days" (sorry, Sparrow) as well. But the "wind" is still there. "The Lord's hand is not shortened, that it cannot save; neither His ear heavy, that it cannot hear:" Isaiah 59:1. He is still leading, still guiding. It is His work that He has promised "He which hath begun a good work in you will perform it until the day of Jesus Christ" Philippians 1:6. There is always some sense of excitement in preparing for a trip -- the planning, the preparing, the packing, checking and double-checking lists to make sure nothing is forgotten. But the stacks of drab olive green belongings in the living room speak of another trip. A trip of business, purpose: a trip of war. As the days tick by it still seems so unreal, almost like he will be going off to one of those special forces schools, instead of going to some far away country. I remember the day he left for boot camp, a day when going without seeing him for three months seemed impossible to bear. But the Lord was faithful and carried us through the waiting. The Lord has not changed, His arm is not shortened. He will be and do what He has always been and done. . .Faithful and Abundantly Sufficient. It was a strange feeling, to suddenly realize I was all alone. Glen had gone to run errands, Marie was at work and Emmie had gone to a school function. Only Sparrow and I were left at the house. As I took her for a walk, I realized it was one of the rare times when I found myself alone. Not one of the rare times during the day when I found myself alone, one of the rare times in my life when I found myself alone. I lived with my parents until I was twenty-one, when I married Glen. Two years (minus 9 days) later, the babies started coming. Except for a couple business trips I had to take to Dallas, Glen and I have never been apart. We never went on trips without our children, we preferred to stay home with them rather than travel without them. Over ten years ago, a neurosurgeon told me the worst thing I could do for my neck was to drive. Since then I have driven myself to very few places. Instead, my husband graciously provides chauffeur services for me. So I find myself alone very rarely, even driving to work. I am not a person who dislikes solitude. Being basically shy and introverted, the peace and quiet solitude brings suits my personality well. It reminds me of how much like my father I am, while I know I am so much like my mother as well. Being alone, though, can be a fearful thing. 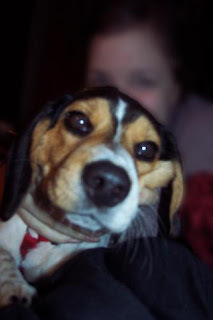 Perhaps if I didn't have the company of the world's most wonderful beagle, Sparrow Jean, the Wonder Dog (as I have begun to call her lately), I would feel the fear of aloneness more. The truth of the matter, however, is that I can never be alone. The Lord Jesus lives inside of me and I live and move and have my being in Him. I am surrounded, inside and out with the Lord. I can never leave Him and He will never leave me. Never, ever will I be alone. No matter where I go, no matter what situation in which I find myself, He will be there with me. What comfort! What encouragement! What peace! Never alone. "For He hath said, I will never leave thee, nor forsake thee." Glen and I had a cold Saturday. Our day ended at a football stadium which is known for the wind whipping through the stands. 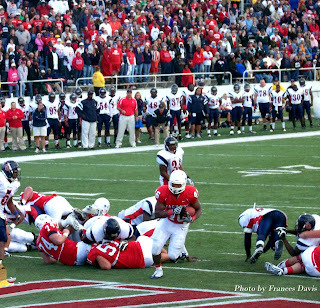 As we cheered the local college football team, we once again found ourselves cold and shivering. Being familiar with this stadium from our oldest daughter's high school band days, we had dressed well for the chill of the game. I had on two shirts, a sweater and a leather jacket and a shawl over that, but the wind still seemed to pierce right through me. Sweetly my soul doth rest. Only a few more tears. Today while we were kayaking, we had the wonderful pleasure of seeing a flock of birds fly over us in formation. Their precision was beautiful to behold. 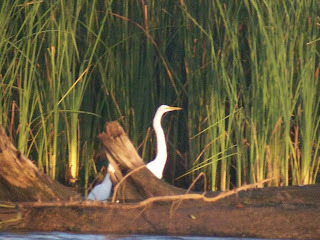 As we sat on our kayaks watching them, I told Glen about some things I had remembered hearing about birds in formation. The instincts in birds and animals are programmed by their Creator for specific purposes and are not random occurrences. We are told that birds fly in formation for several reasons. 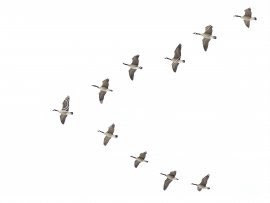 First, this formation reduces the air drag that each bird experiences and therefore they have lower heart rates while flying than birds that fly alone. This makes them able to travel farther with less effort. The birds rotate the lead position, which is the bird that experiences the most resistance and has to work the hardest. They also rotate the outer tip positions, because those two positions also experience more resistance. Flying in a V fomation also allows each bird to have the others in their field of vision. This helps them to communicate with each other and to keep track of each other within the group. If one bird must fall out of formation because of illness or injury, two others will fall out with that bird to help and to offer protection. As Glen and I watched these birds perform this before us, we mentioned how like the Body of Christ this was. We are all united in a wondrous bond that can never be broken. We support each other, we are part of a team, a group -- a Body. What affects one member, affects all in some way. We must remain close so that we can easily communicate, to keep track of each other, to help and protect those who become ill or injured. We have a great power among ourselves of which we are so rarely aware. The power of praying for other believers in the Body of Christ is not a futile or rote repetition. This is something that has great significance and consequence. Let us take our responsibility in the formation very seriously and remember to "pray without ceasing" for our other members and to ask the Lord to reveal to us areas where He would have us help, support and protect them otherwise. We were fairly well prepared for our first "cold" journey out. Glen had waterproof pants, I had neoprene pants and waterproof shorts. We wore layers up top. Glen thought of wearing gloves, which was the only thing I wished I had remembered and didn't. We even had a thermos of hot chocolate to share on the river later in our journey. We had decided before we even reached the put-in that we would NOT go ten miles like last week and that we would just go slow and easy. Looking out over the bay, it was easy to tell it was low tide, so I also added to our lists of "nots" that we not go into Mobile Bay. I didn't feel like being a gondolier again today. As we started out, I was really impressed by my new waterproof socks. Glen had made a special trip to purchase them for me and surprised me with them after work yesterday. Never in my life did I imagine I would be at the point where a pair of waterproof socks would excite me, but they did. Especially this morning when I first put my feet in that chilly water and my feet stayed dry and relatively warm. To give credit where it is due, they are called Sealskin and you can find them at www.danalco.com. The water was a little choppy as we first set out, but I had expected that. I had looked at the Marine forecast last night and saw that we would have some wind to deal with, hopefully though, it would be in our favor. I had only brought one camera with me, so I didn't bother setting up the paddle rig for my video. Looking ahead toward the sunrise, it was interesting to see the fog rise up off the river. Try as I might, I couldn't capture on the camera what my eyes were seeing. We decided to travel up river and the paddle was quiet, peaceful and very enjoyable. For the most part, I was dry. I could feel a little bit of water seep through the seam of my neoprene shorts, but that was all. The only part of me that was really cold were my hands. I even pulled my sleeves down over my hands and tried to paddle like that, but unfortunately my steering was less than optimal. We reached an hour out and decided to stop and enjoy our hot chocolate. It was so nice to have that while we rested. At some point during our rest, Glen pointed out to me that the water was actually warm. I dipped my hand in and found it to be much warmer than the air! After than, I frequently put my hands in the water to warm them. It seemed so odd doing that when I was used to putting my hands in the water to feel the coolness of the river. As we rested, the strong current -- aided by the increasing winds -- carried us back almost to Chacaloochee Bay. We had to cross the river first, and go against the strong wind and the strong current, but it didn't take long to reach the bay. We had thought at that point the current would just take us in, but we were wrong. We were still against the current. As we paddled closer to the put-in, the wind really increased. It was so much harder to paddle against the current, that I was stabbing the paddle into the water and having to pull hard on my abdominals to force my boat against the current. Water was spraying up over my bow and all over my legs and arms. When we were finally even with the put-in, all we had to do was line the bow toward shore and the current literally pushed us all the way in. I think this was the first time ever I was really ready to get out of the water. I was tired after fighting the current twice. When I went to stand up, my legs were so tired from bracing against the boat to help paddle, I almost fell down. Once we were out of the water, and into the wind, we really began to feel cold. We loaded the boats as quickly as we could and rushed home to a hot bath and shower. I really enjoyed this colder kayaking experience more than I thought I would, but I will bring gloves before I go out again. Well, it came. Wrapped in plain brown paper, no stamps or insignias, just two plain white labels. It came, just the same, this package of information, speaking so matter of factly of my son's deployment. No marking on the envelope could begin to tell the importance of the information within. I read the contents, looked over the checklists, read the advice with interest, but so little of it seemed to apply to me. Most of it was for spouses and children. There was nothing about how to send your only son to war, and even as I write these words, I am struck by the fact that there is One who has been where I am. There is One who knowingly, even lovingly, sent His only Son to death. That sending, that death was the darkest moment in human history and yet was the most glorious event of all eternity. Sometimes I wonder that I don't feel more fear -- surely the Lord can't make my heart this peaceful, but there is little fear there. I feel sadness, for a year is a long time to go without seeing your son -- and I think of all the family times that will be less joyful because he is not here. I feel sadness for the grief Emily will feel at being separated from the brother she adores. And I feel sadness for Aimee -- a year is a long time to an eighteen year-old girl. I feel sadness for Noah, too. Sadness for the things he will miss, for the comforts he will do without, for the sights and sounds and memories he will forever try to erase from his mind. But as for his safety -- he belongs to the Lord, and he always has. I feel certain that the Lord knows that this is exactly what Noah needs to draw him closer to the Lord. I am sure that in the dark of night when bullets fly, Noah's heart will cry out to the only One who is his safety -- the Lord Jesus. And as always, He will be the Answer. Noah is still home. But Noah is not home. The closer we get to his departure date (whatever it is, because we don't know), the more away from home he is. This is just a depository for his things. And even when he is here, I feel like he isn't here. There seems to be so little emotional attachment for him here that I wonder just how long it has been since I have touched the "real" Noah -- you know the one -- the tenderhearted, witty, laughing, Noah. Does the prospect of war loom so heavily upon him that it oppresses his thoughts even now? Does the specter of separation from those he loves haunt him so much that he has already begun the separation himself? Is there some knowledge, some fear, some question that presses so hard and so heavily on him that he must keep a distance from those who love him so much? I have no answers for these questions, but one of my favorite pictures comes to mind. In this picture I am sitting on the bedroom floor in the old house, doing something like putting on makeup. Around my neck is a pasta necklace, obviously a present crafted from little hands. Sitting next to me is a young Noah. In this picture it seems as if he is telling a story and I am listening while going about my activity. I love this little glimpse of life passed by when Noah loved to relate every detail of every event. He was such a wonderful storyteller -- no twist in the plot was left unveiled, no detail, no matter how trivial, was deleted. An oh, those marvelous little boy sound effects! How do little boys learn to mimic cars and boats and engines so well? You could always depend upon Noah's stories to somehow make you laugh. Not that the stories were always funny, mind you. It was just that he took so much joy in the telling of them and that joy would spill over into your own heart. Oh, to hear one more little boy story! But that isn't what makes that picture so special. Nor is it because a little toddling Emmie is also in the picture. It is because in this picture Noah is sitting as close to me as possible. Our backs are propped up against the wall and our legs are outstretched and Noah is sitting close to his Momma. Ever since he was old enough to walk away from me, Noah loved to be physicially close. There could be an abundance of couches and chairs in a room, but Noah was going to choose to sit right next to you -- in your lap if at all possible. Even when he became a bigger boy, too big for lap sitting, he would edge his way as close as possible. But by this time he had learned to ask for a back scratch as well, and he usually got one! I knew the day Noah left in that van for boot camp that my "little boy" was gone forever, but little did I know the tenderhearted laughing, loving son would be buried so deep beneath the Kevlar and cammies. These days Noah walks around with a sort of Rhett Butler-ish swagger that gives the world the impression he is saying the same thing that Rhett did, that "Frankly, Scarlett, . . ." Well, you know the rest. I can only pray that one day Noah will take that turn in the road most young adults do and realize the people who love him most in the world are the ones who have prayed for him everyday of his life. Perhaps one day Noah will come in and sit close to me again, just for the sheer pleasure to sit next to his Momma. And you can be very sure he'll get a back scratch out of it, too! During a group discussion the other morning, my husband was giving the example of children picking sides for teams to play games. He spoke of how it caused a sense of pride in the hearts of the young men who were chosen first by the team captains. As I looked around the table at the group of adults, I realized they all had been fine athletes as children and everyone at the table had been familiar with the feeling of which he was speaking. As a child I was chunky and slow, clumsy and uncoordinated. As the teams would start to line up on the playground, dread would fill my heart. Each time a captain would look over the group to pick a team member, my hopes would soar, and each time my hopes would be turned into disappointment as someone else's name was called. Finally, I would be the only one left and the last captain would be forced to reluctantly take me on as a liability for their team. I grew up both fearing not being chosen and being familiar with the feeling as well. Now to be fair, there were a couple of times I was chosen during my school years. I was chosen as the editor of my high school yearbook and I was in a singing group -- not the "A" group, or the "B" group, or even the "C" group, but not rejected entirely! Chosen, finally, I am chosen! Ah, but let me read it again, lest my heart - like those athletic boys on the childhood playground -- turn to pride. "Chosen us in Him". Chosen in Him. I was chosen because of my relationship with the Lord Jesus Christ. Not because of my merit, my skill or my goodness, only because I was found "in Him". I may not have been chosen for all those teams on those playgrounds so long ago, and many tears were shed in my heart for that. But Hallelujah, I have been chosen in Him, and how much greater, how much sweeter, how much more wonderful to be a part of Him for all eternity. GLEN: If we have our druthers, that is, if schedule and weather permit, Frances and I will see the Saturday sunrise in the water and aboard our kayaks. Sometimes I wonder if we'll ever get tired of the dawn's first light, and if I'll ever see the rising sun without a tear falling from my eyes. I doubt it. Indeed, if we could be on the water every morning for every sunrise, we'd be there. They're all different, and all beautiful in their own special way. Some shine through clouds, and are often the most amazing to behold. Some ascend from the eastern horizon by themselves, and ignite the waters with fiery sparkles. And some do a little of both, as clouds give way to clear sky, and bless us with a varied display of light too sublimely splendid to describe. All speak. "The heavens declare the glory of God." Without being mystical, I can hear a voice, the voice, in the sunrise. It speaks without words, and tells our spirits of glories that have always been, and will always be. It speaks of God as Creator and sustainer of all things. It speaks of His beauty and power. 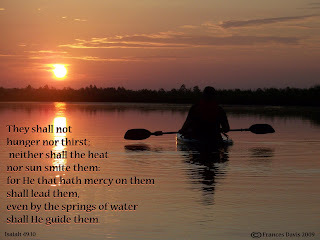 It speaks of His faithfulness, promising with perfect assurance that the sun will rise for us every morning, and that "day and night shall not cease." 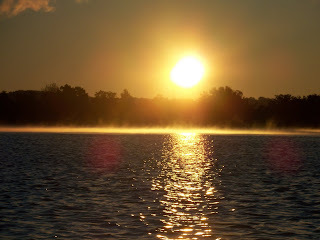 Most of all, it speaks of the Lord Jesus, "the sun of righteousness risen with healing in His wings." This is the thought that brings the tears to my eyes, because this is the love and hope and grace and mercy and all of God so lovingly made available to us. Yes, if we had our druthers, we'd be there waiting for the sunrise on the water every morning, the sunrise that, as the One it so wonderfully images, will never disappoint. FRANCES: As we put-in this Saturday, I had similar thoughts. I was putting the half of a paddle upon which I attach the video camera, into the scupper hole of my kayak and I had the thought, "Do I want to video the sunrise this morning? Am I getting tired of photos of sunrises?" I went ahead and put the camera on the paddle and put the second camera in the waterproof bag around my neck and paddled off. 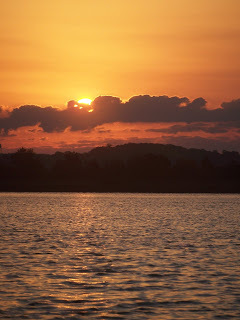 A few minutes later, as we were paddling toward the sun, we were blessed with a new sunrise: beautiful, glorious and worthy of both the video and still camera, neither of which could capture the wondrous beauty we were watching with our eyes and hearts. Our trip today was interesting for us. This was the latest in the season we have ever kayaked. At 58 degrees, it was also the coolest ambient temperature in which we have ever paddled. I took the opportunity to try out my neoprene shorts which I had hoped would be waterproof. They were not. They did, however, add a layer of warmth that was nice. The water temperature was still around 78, so it was not too much of a shock when we put our feet in the water. There was a steady breeze all day, turning into a good wind later on, which either hindered or helped us, depending upon which direction we were heading. We started out about 6:30 am and low tide was at 8:34. That affected us a great deal as we entered Mobie Bay. For several parts of our 10-mile journey, we found ourselves in about 6 inches of water. I felt more like a gondolier than a kayaker. In fact, at one point, I told Glen I felt like I could move faster if I would just get out of the boat and pick up the bow and drag the kayak behind me. With clear skies, we were able to complete our trek to the side of the bay that was interrupted last time. On the way back we were treated to a view of beautiful wildlife enjoying the sun. Once we got back to Chacalooche Bay, we had the delightful discovery that the current was with us. In fact, we wouldn't have even needed to paddle if we had all day to just float back to the put-in. As it was, we were able to just add our steering to the current to get us back to the car. It always surprises me that no matter how tired I am at the end of a trip, and even though I may really be ready to go home, I am never ready to get out of the water. There is just something in me that loves being on and in the water. I guess now I know why my Daddy loved being at sea so much. It is an odd thing, this specter of war which hangs over us. We do not really talk about it, but not a day goes by that it doesn't enter my mind. Then I think too, of what our son is trained to do. He doesn't repair military automobiles, he doesn't run the supply chain. he is part of the eyes and ears of the Corps. I think I would like it better if it was just "Recon". Something about adding that one little word, "Force". Well, he is the Lord's and his safety is completely the Lord's. I pray that he will be ready for what he has been trained to do. Oh, I don't mean I pray that he has been trained enough, or I pray that his body is in good enough shape. No, I'll leave that up to the United States Marine Corps. What I mean is I pray his heart is ready. I pray that he isn't trusting in his own might and his own strength but in the Lord, I would want to hear that affirmation of faith from his lips and to know that his heart was at peace because his mind was because his mind was stayed on Him who is his real strength. I trust the Lord will use these days to work that in his heart.